Beware of the effects of smoking on your mental health! Everyone knows that the smoking is dangerous, but almost none of us give the full attention to this serious health problem. Smoking is the most wide spread addiction. On average, a tobacco consumer smokes 15 cigarettes a day and the trend in consumption is constantly rising, especially in poor countries. Consumption of tobacco has increased in poor countries, but in more developed countries it has decreased. This decrease happens due to the raised awareness about health problems associated with tobacco smoking. Most people smoke because they simply cannot stop it. Nicotine is a highly addictive substance and giving up on cigarettes usually provoked series of withdrawal symptoms. It is estimated that 70% of people who actually quit smoking, eventually start again. People start smoking for different reasons such as commercial influence or other social and psychological reasons. Many people claim they smoke because it helps them to relax or gives them a rise of confidence. For others, it is an easy lubricant for social interactions. 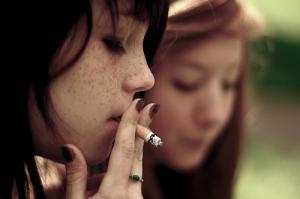 Young people usually start smoking due to peer pressure, to feel more mature or rebellious. Like any other addiction, smoking causes severe changes in the behavior and mood of a smoker. If smoker doesn’t get the daily dose of cigarettes, he will probably become annoyed and bad-tempered. Smoking is tightly associated with psychological problems. Most of the people consume tobacco when they feel unable to cope with everyday stress. However, easing the symptoms of stress and anxiety and covering those up with excessive use of tobacco or alcohol may lead to severe mental health problems and depression. A common prejudice is that smoking helps people relax. Actually, the truth is quite different. Smoking gives just a temporary feeling of relaxation, but it actually increases anxiety and pressure associated with withdrawal symptoms. Smoking is also associated with depression. It is estimated that smoking rates are twice as high in adults with depression. These people may find it especially difficult to quit smoking, as nicotine releases dopamine in the brain, a chemical responsible for positive feelings and happiness. This way, people suffering from depression, in attempt to quit smoking, may experience even more severe symptoms of psychological problems. Other interesting connections between smoking and metal health indicate that people with schizophrenia are three times more likely to smoke. They also consume tobacco in excessive amounts. The possible reason of this kind of abuse is the attempt to manage symptoms associated with schizophrenia and side-effects of prescribed drugs.